The security of deployed and actively used systems is a moving target, influenced by factors not captured in the existing security metrics. For example, the count and severity of vulnerabilities in source code, as well as the corresponding attack surface, are commonly used as measures of a software product’s security. But these measures do not provide a full picture. For instance, some vulnerabilities are never exploited in the wild, partly due to security technologies that make exploiting them difficult. 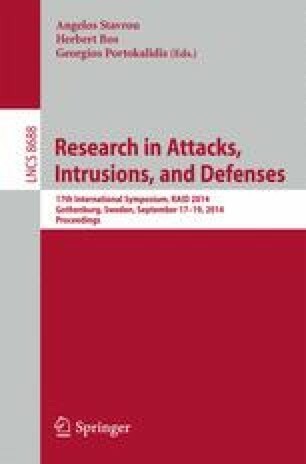 As for attack surface, its effectiveness has not been validated empirically in the deployment environment. We introduce several security metrics derived from field data that help to complete the picture. They include the count of vulnerabilities exploited and the size of the attack surface actually exercised in real-world attacks. By evaluating these metrics on nearly 300 million reports of intrusion-protection telemetry, collected on more than six million hosts, we conduct an empirical study of security in the deployment environment. We find that none of the products in our study have more than 35% of their disclosed vulnerabilities exploited in the wild. Furthermore, the exploitation ratio and the exercised attack surface tend to decrease with newer product releases. We also find that hosts that quickly upgrade to newer product versions tend to have reduced exercised attack-surfaces. The metrics proposed enable a more complete assessment of the security posture of enterprise infrastructure. Additionally, they open up new research directions for improving security by focusing on the vulnerabilities and attacks that have the highest impact in practice.